ACCOUNTING STUDENTS – Are you planning to cram to save your wam, or hoping to finish your degree with an impressive HD? 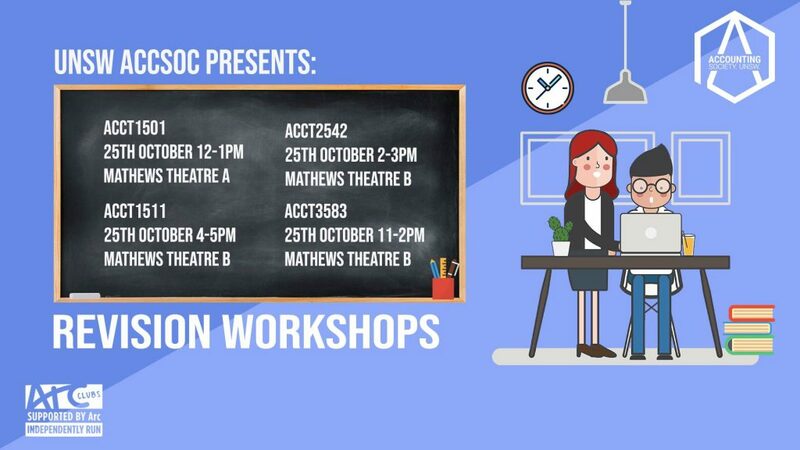 Whether you are struggling or excelling, AccSoc is bringing back its revision workshops to help everyone achieve their goals. This semester, AccSoc is running intensive workshops for 4 different courses: ACCT1501, ACCT1511, ACCT2542 and ACCT3583. Tutors will be re-examining 3 of the most popular topics as previously voted by you. So whether you’re behind in weeks of lectures or up-to-date, don’t miss out on this extremely valuable opportunity – remember to register!